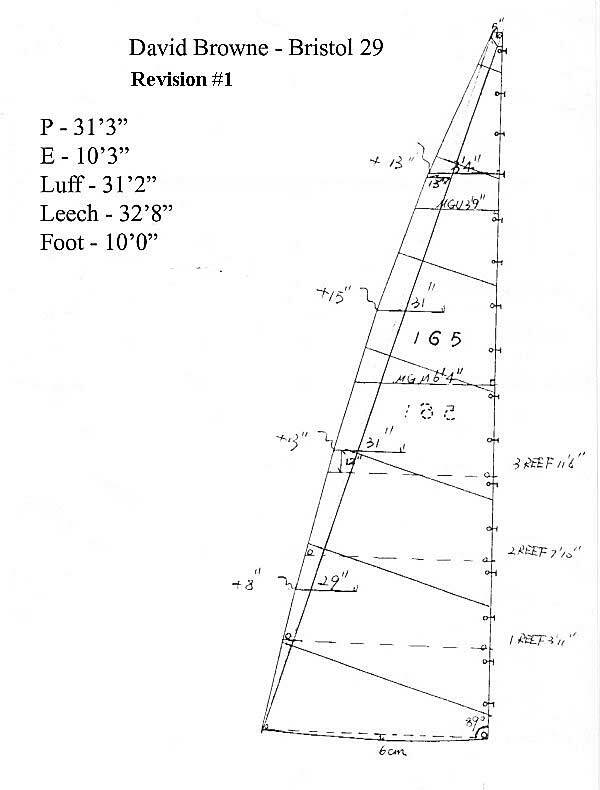 You probably think I am nuts to mess with a Herreshoff design, and I may be a little nuts, but on a CCA designed boat like the Bristol, or other boats of the 1960's that make maximum rating (early Albergs, Pearsons, Cape Dorys, Tartans and others) use of massively long booms , inboard keel-attached rudders, long overhangs and relatively short rigs, the result will be a lot of weather helm. A little weather helm is beneficial to help improve the boat's pointing ability; a little is also a good safety factor - if you release the helm the boat will round up into the wind (useful when you fall overboard). When I added the bowsprit in 1988 all my calculations showed that the boat would be faster and weather helm reduced. It was all theoretical at that point, much as shortening the foot of the main is now. I called Halsey Herreshoff and explained my calculations and what I was trying to accomplish. Halsey argued vehemently that I simply didn't know how to sail the boat, that I was keeping the leech too tight and not allowing enough twist in the main. He also assured me that if I moved the headstay forward I would ruin the boat. Well, it turned out I was right and Halsey was wrong, which I think only proves how rig designs are constrained by rating systems. Weather helm was indeed reduced, the boat was faster and stood up more to the wind so reefing was delayed. In addition, the bowsprit gave me a great platform to hold two anchors, and a great perch to watch the bow wave and take photos. Shortening the boom is another way of reducing weather helm. The B29 boom is gigantic, over 13 feet long. The main has a foot measurement (E measurement) of 12.9 ft. 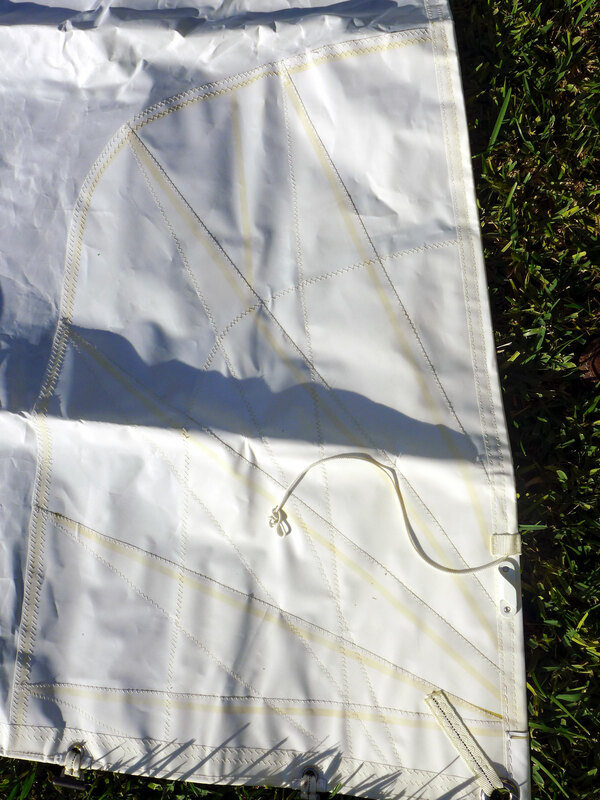 I am reducing that measurement to 10.3 ft. With added roach over what the sail maker recommended, that brings the sail area from 201 sf to 181 sf. Keep in mind that that lost area is at the leech, not in the area of power in the chord. That rear area of the sail accounts more for leverage since it moves the CE further aft which is expressed as weather helm. 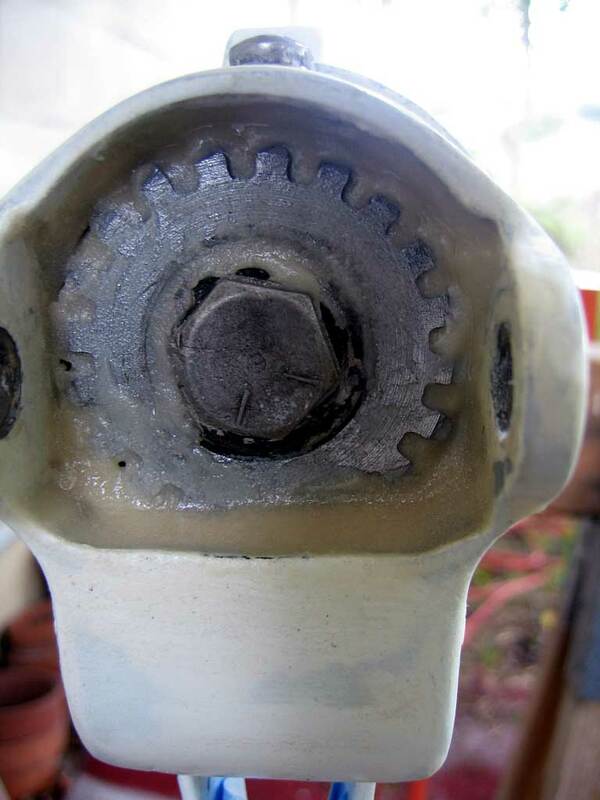 The long boom of the B29 (and other CCA rated designs), when sailing on a broad reach also adds to the lever arm effect, providing more force to leeward and less forward thrust. 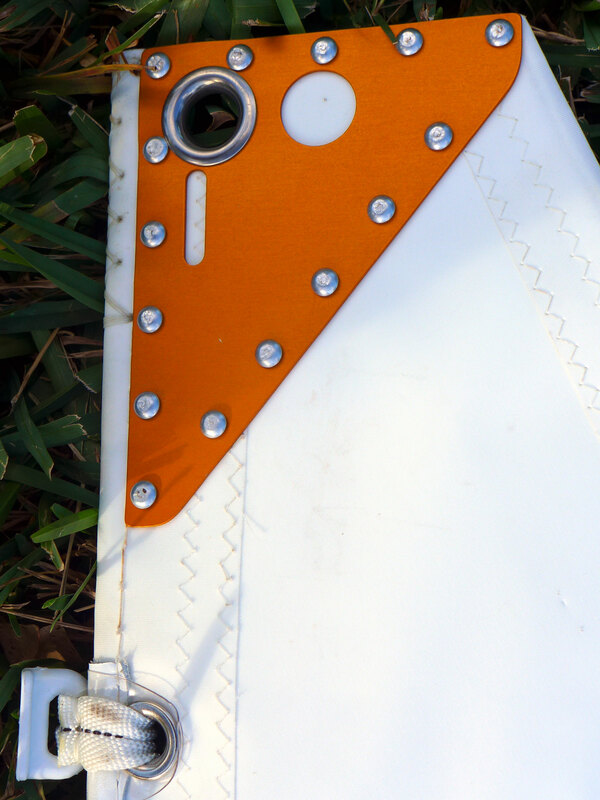 A shorter boom for any given rig height provides a higher-aspect sail ratio. and gives greater windward power. The shorter boom moves the center of Effort inboard, offering a more aerodynamic shape to the sail, even when the wind is abaft the beam, and keeps the sail powering and not stalling. 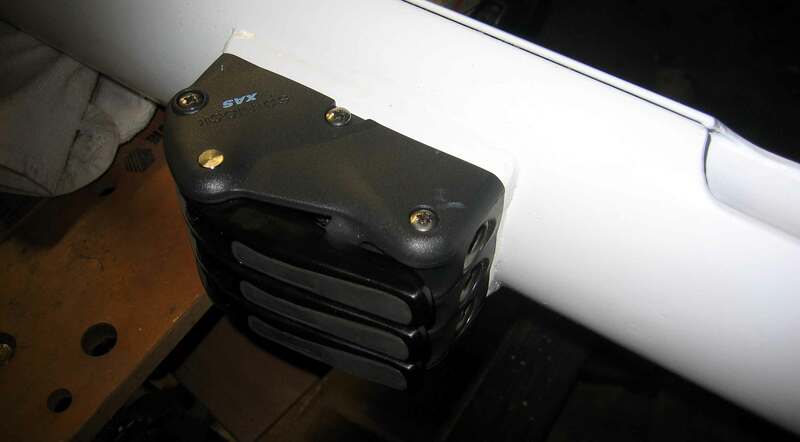 Since the lever arm is shorter, the sail produces more lift and less drag. 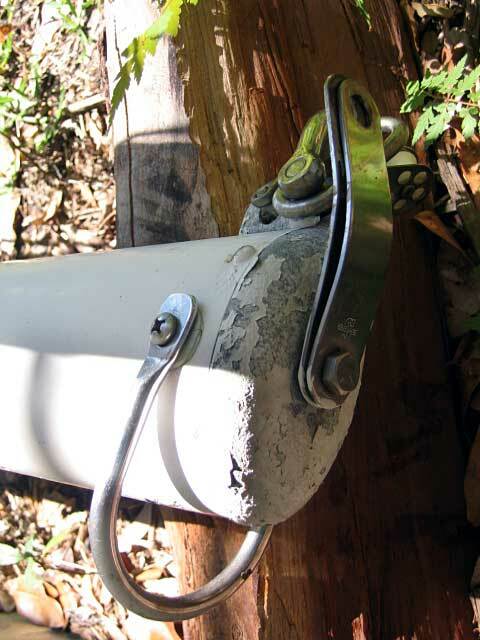 Shortening the boom benefits the boat in other ways. It moves the main sheet to the center of the cabin, out of the cockpit and terminated to the middle of the boom instead of the end. 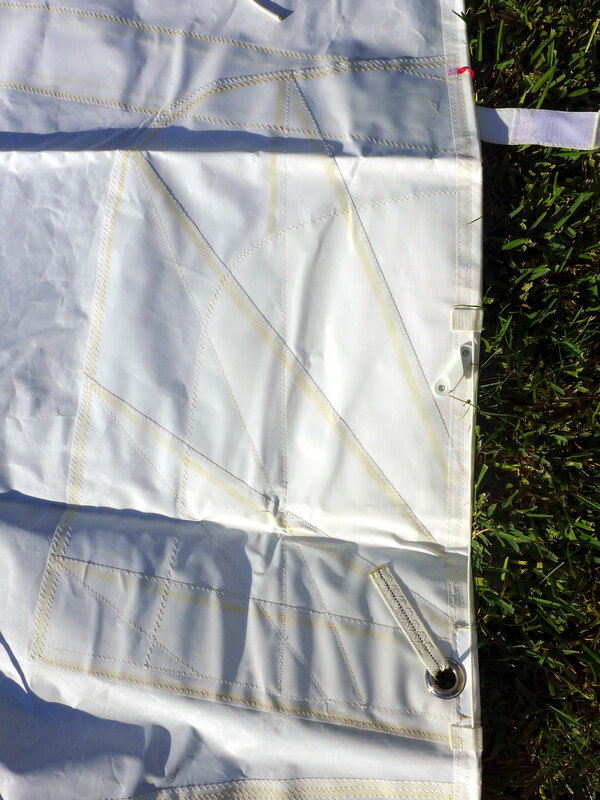 Without the sheet at boom's end, a bimini can be more simply and easily erected and used while sailing. 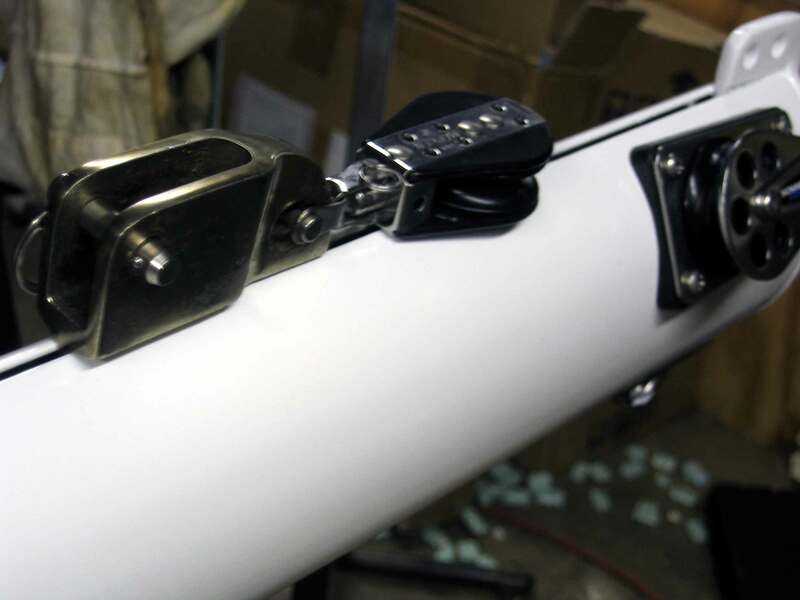 Since the mainsheet is terminated midboom, the boom vang is eliminated, and sheet control is close at hand to the companionway (and under the dodger), instead of at the rear of the cockpit. Cutting the boom, relocating hardware based on its new size and refinishing. 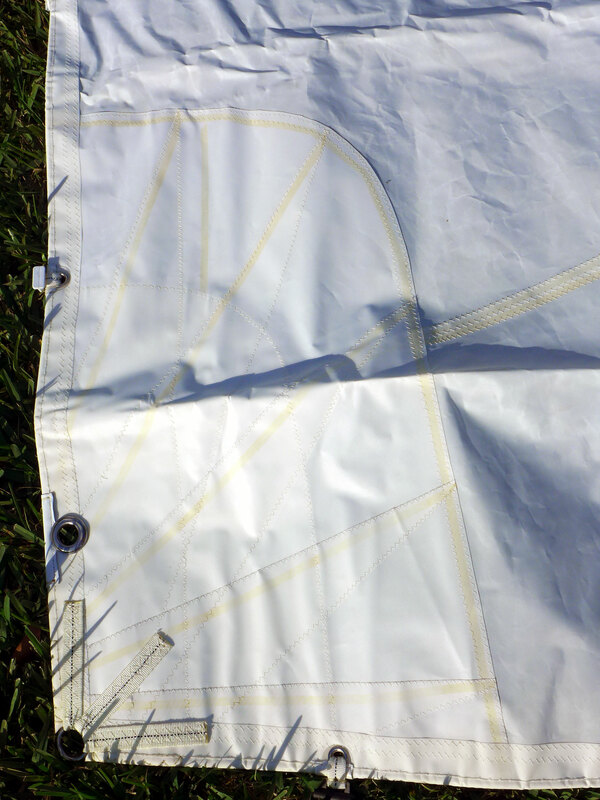 Replacing the main and determining how much reduction in sail area is the right amount. Adding/replacing winches on the cabin top to handle the main, traveler car controls and any other lines brought back from the mast. Building a dodger coaming and eventually ordering or making my own dodger. I stripped all the hardware off the boom after trimming it to its new length (137 inches). 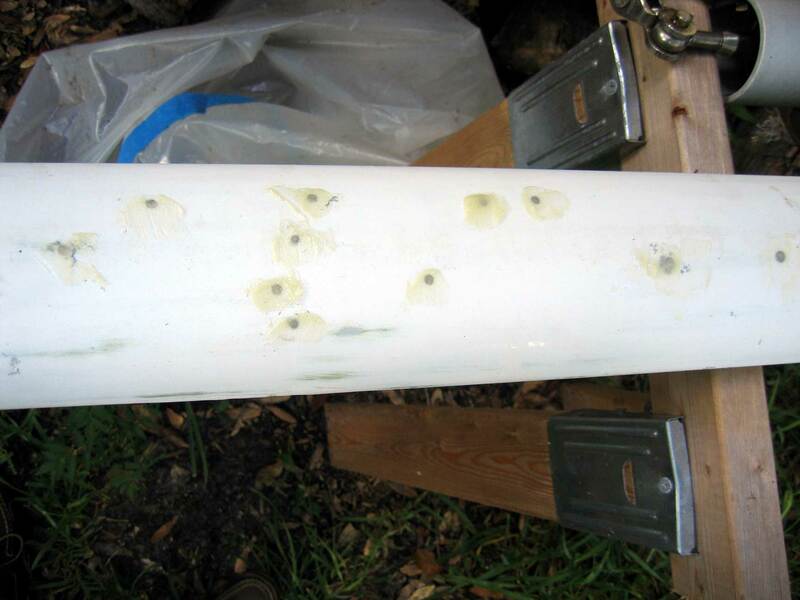 The boom looked like Swiss cheese when I finished--holes all over it from various experiments with fittings and leads. So the first order of business is to fill the holes that I won't be using--most of them--with epoxy. The holes don't weaken the boom, but I just felt they should be filled and I can start all over drilling and tapping new holes. 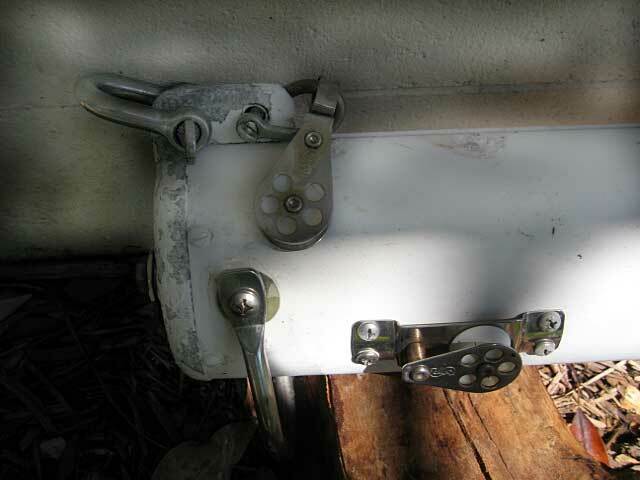 At the same time I decided to build a mounting base for a triple Spinlock XAS rope clutch that will lock off the three reefing lines to the leach reef cringles. In the past I had used a small winch on the starboard side of the boom, but the folds of sail when I reefed down always interfered with using the winch effectively. So this time I have decided to take the lines to the main winch on the mast and rope clutches to lock them off. 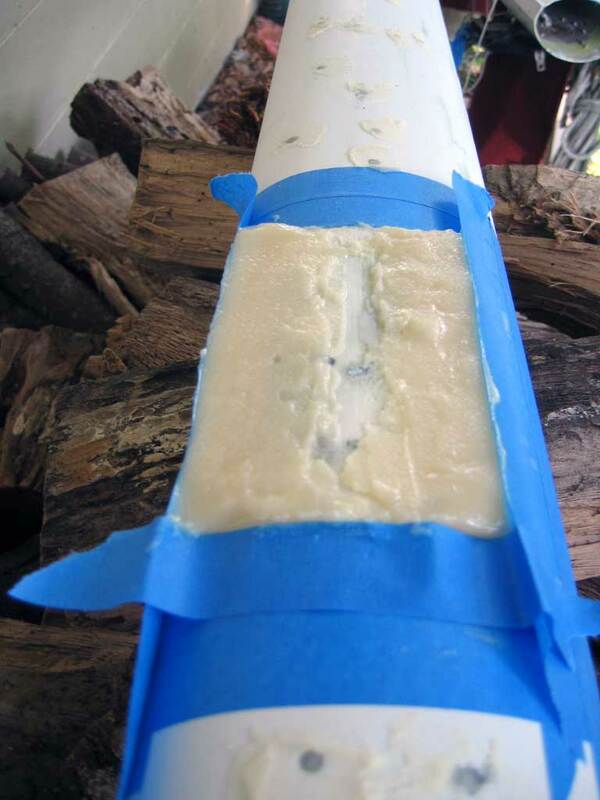 I could make a pad out of a number of materials, but epoxy was handy. 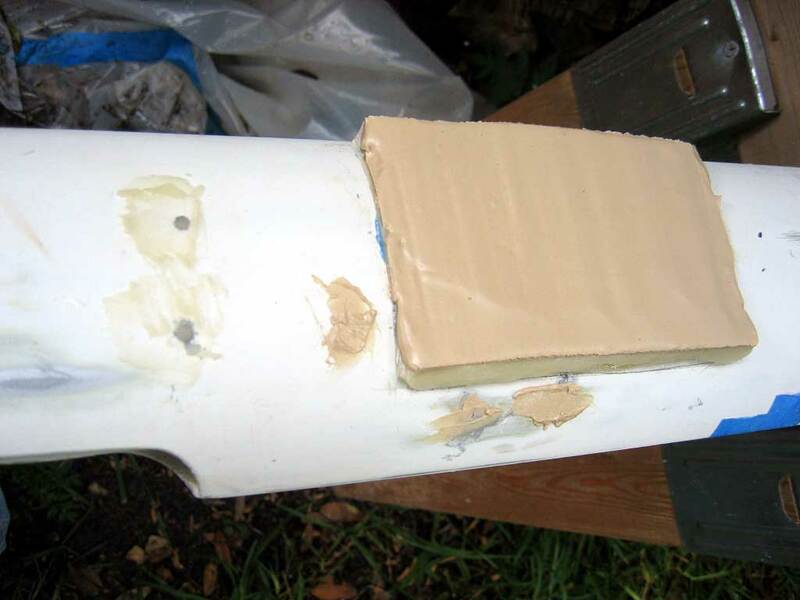 I used masking take to build little dams to hold the thickened epoxy and tried to layer it on evenly. 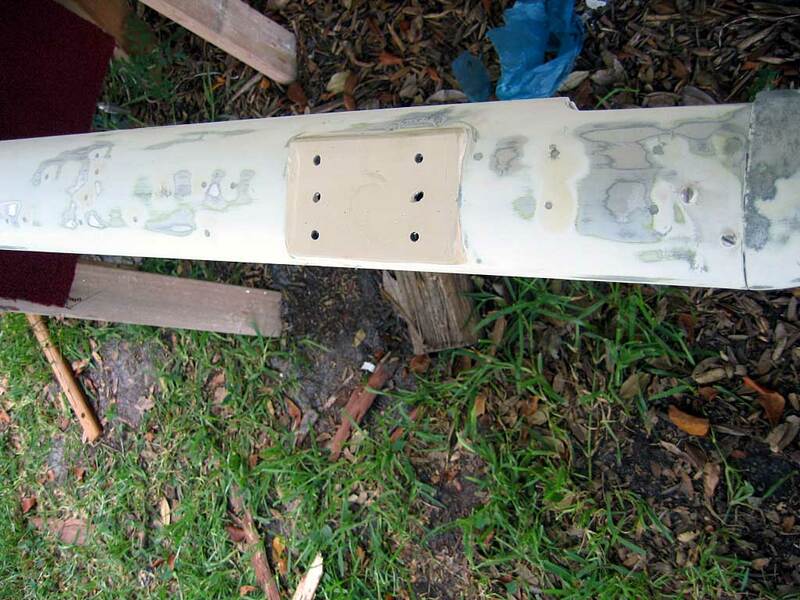 I will smooth it out with some sand paper on a block, then drill the six holes and tap them. Since I am planning to lead the main outhaul back to the cabin top for adjustments, it because obvious to me that I had to lock down the boom from rotating at the gooseneck. As it stands, the boom will rotate as the main sheet lead "pulls" it, slanting the boom the more it is let out. The outhaul will run forward from a turning block to the gooseneck to another turning block, down the the base of the mast to another turning block and aft to the cabin winch. But this rotation of the boom will not give me a fair lead for the outhaul at the gooseneck turning block. So, to make a long explanation a short solution, I poured it full of epoxy, it it won't turn any more. 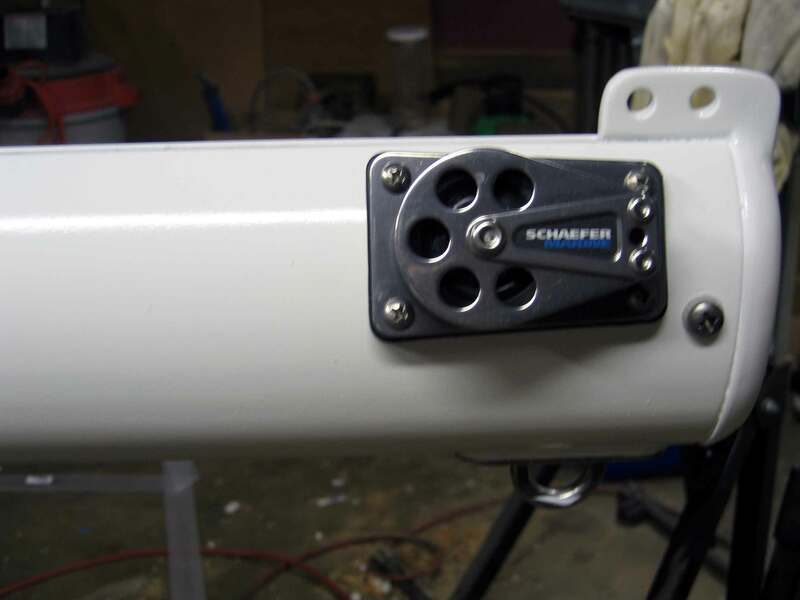 Having finished painting the boom with System Three Orcas White LPU, I installed the hardware. Here are some pictures of the "new" 40 year old boom, versus what it looked like before I began this refit. Here is the new boom endcap, from Rig Rite. 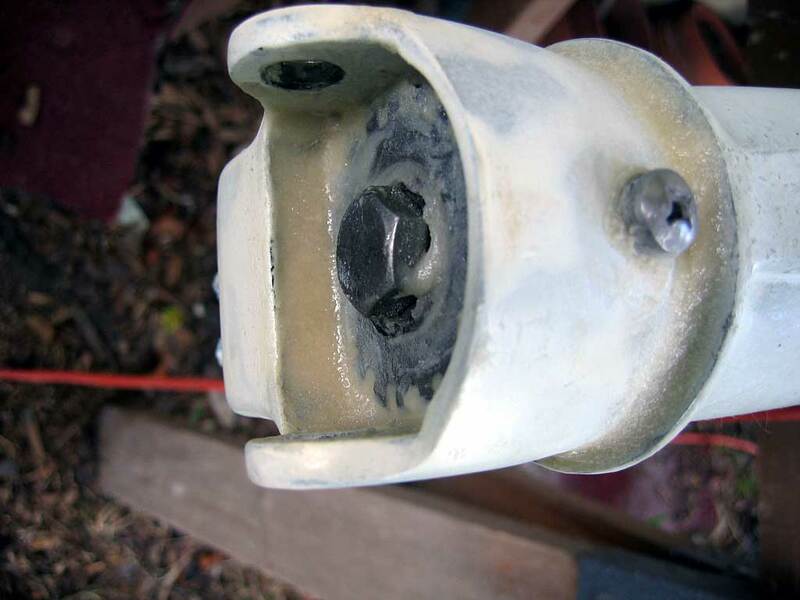 The old endcap was badly corroded, and used the old roller reefing tangs for the mainsheet. Shown here is the new bronze outhaul car, also from Rig Rite. Bristol did not normally supply a car, which means the aft most sail slug binds and the outhaul is not a fair lead. The outhaul leads around the block at the car to a new turning block, forward to new turning block at the gooseneck, down to a turning block at the mast base and back to the cockpit to a winch. The old outhaul arrangement was never very fair and simply went to a cleat at the outboard end of the mast. The reefing lines come forward on the starboard side of the boom through five fairleads to a triple rope clutch just aft of the gooseneck, and then to a new winch on the mast. 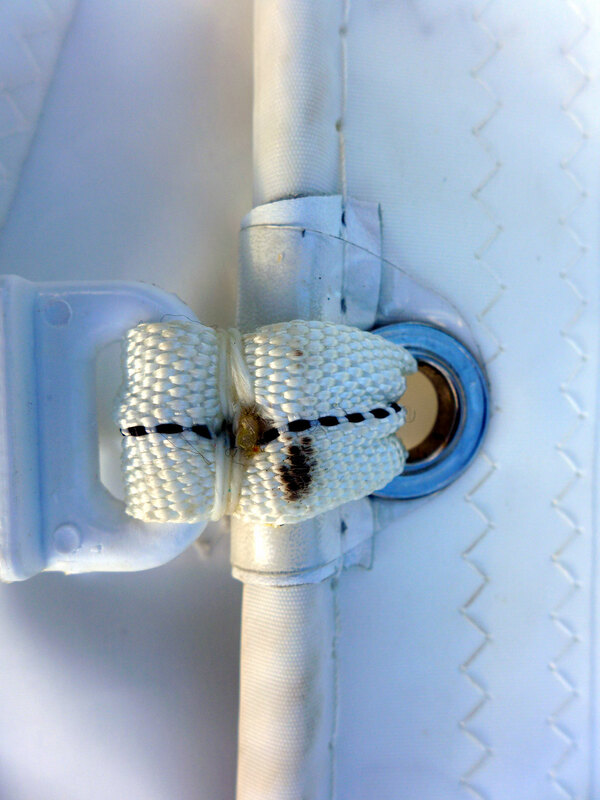 The fairleads should house and control the reefing lines and prevent the spaghetti tangles I had before. 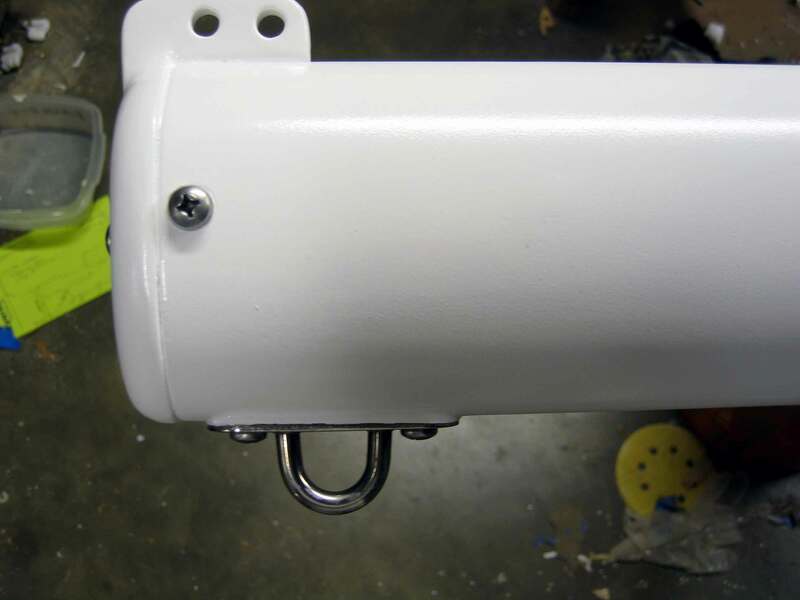 New reefing winch installed on mast. 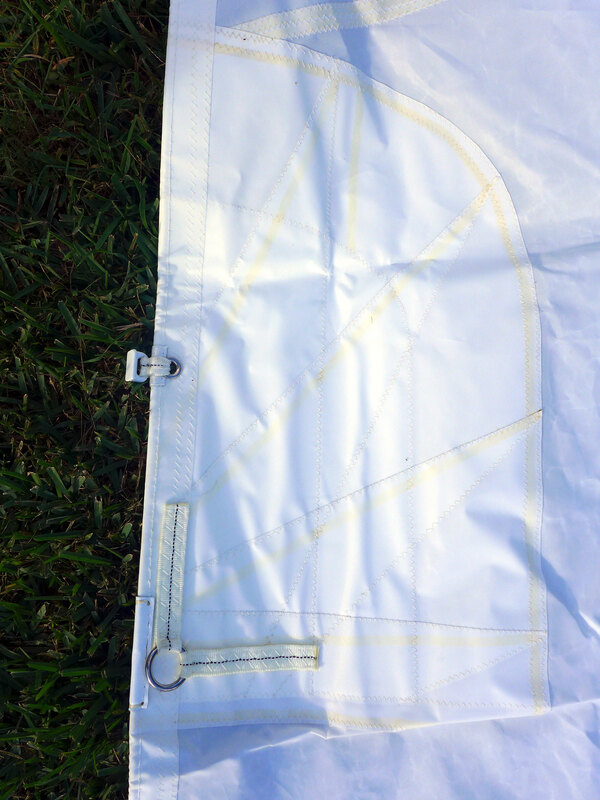 New main from Fareast Sails, HK featuring triple stitching, 6.4 oz Contender SuperCruise Dacron, 3 reefs, cunningham, parallel tapered battens, full length top batten, telltales, hand leathered chafe points at each slug, headboard and cringle. Custom roach, custom slug positions relative to the reef cringles. About $750.00. 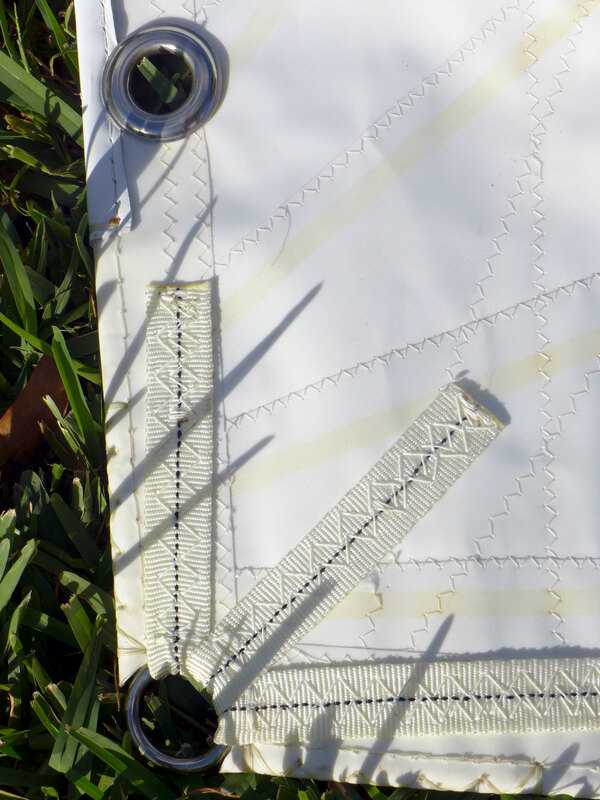 Mainsail tack showing extra large reinforcement patch. Large reinforcement patch at clew. 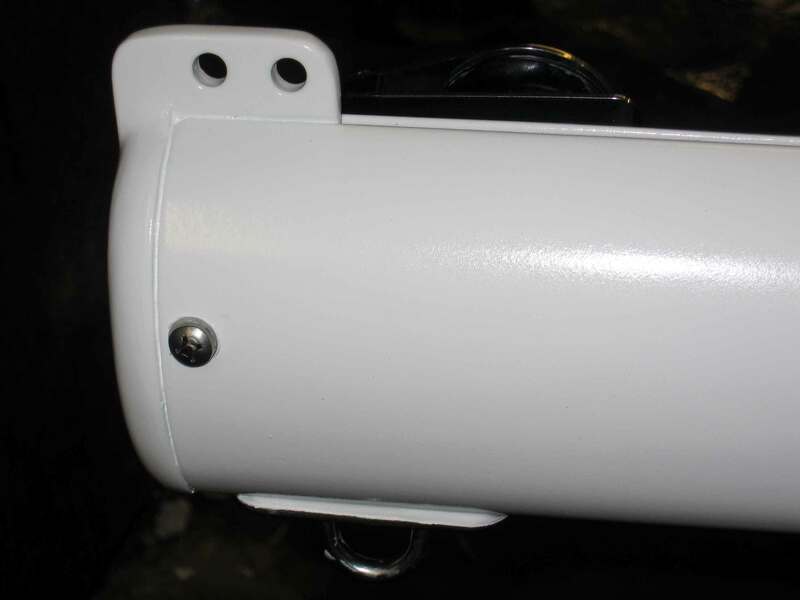 Also the leech line and the round aluminum bolt rope slugs for the Bristol's boom slot. First reef leech cringle and large reinforcement patch, exposed leech line and jam cleat. First reef luff cringle with extra large reinforcement patch and hand leathering. New Garhauer traveler and bridge of 316 stainless. They build these to your custom measurements so they are an exact fit. Also very inexpensive.